Unlimited Mobile Calling Plans | Unlimited International Phone Calls | Free Pc to Phone Calls, Free Voip Calls to India International ! If you are living abroad and away from your friends and family, then you must be spending a lot of money and time (recharging your account). Well what suits you better is monthly calling plans or unlimited calling plans so that you can easily make unlimited calls without the tension of recharging! What you should also try is going for a mobile voip provider instead of a calling card. With mobile voip, you can make calls straight from your phone (no access number). This is simple unlimited mobile to mobile calls. 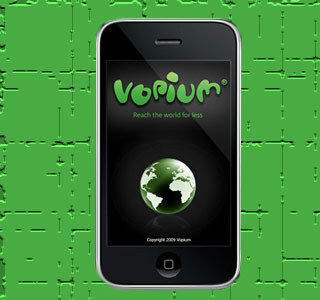 So, today we will look at one of the best mobile voip application for making unlimited international phone calls : Vopium. Call as much as you like from your mobile to landlines in 52 countries and mobile phone in some countries as well. "Call Unlimited" is governed by a fair usage policy limit of 2000 call minutes per month to prevent undue abuse. A lot of our readers are looking for making cheap and free calls to India. Well you can use Vopium to make unlimited calls to India as well. With 8.95 Euros, what you get is 2000 minutes of calls to India (India Landlines and India Mobiles). The effective call cost turns to be 0.7 US cents per min. (That very cheap and very competitive price). Lets see the other popular destinations, where you can use Vopium to make unlimited calls. You can try Vopium for free : 5 Minutes first free call. So first try Vopium, if you like the service then only go for unlimited plan. When you call international with Vopium, you only pay low rate plus your mobile operator for the local call. When you call via WiFi, you don’t even pay for the local call. Call other Vopium users for free. The recording is logged using a standard sound device and can record multiple channels at the same time.